1 of 4 Bring a medium-size pot of water to a boil. Lightly salt and add snow peas. Cook for 3 minutes and drain. 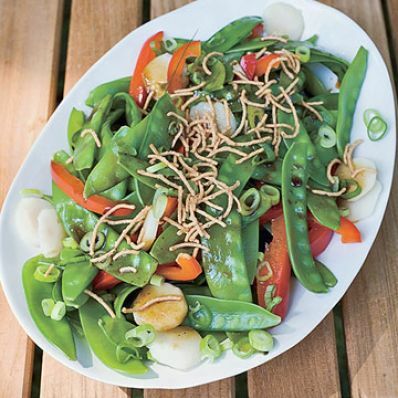 2 of 4 In a medium-size bowl, combine snow peas, red pepper, water chestnuts and scallions. Allow to cool. 3 of 4 In a small bowl, whisk soy sauce, hoisin, sesame oil and vinegar. Toss with vegetables. 4 of 4 Serve at room temperature or cold. Garnish with noodles and scallions just before serving.